Find free, full-text scholarship in the DCN! The University Libraries have added another free resource to our website: the Digital Commons Network. 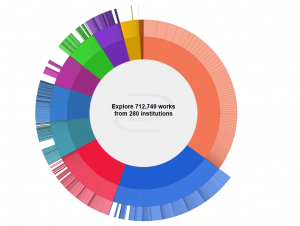 The Network brings together scholarship from 280 colleges and universities that use the software platform Bepress to collect the published articles, reports, and conference papers of their faculty and students. Subject areas include law, social & behavioral sciences, arts & humanities, life sciences, mathematics and physics, education, engineering, health sciences and business. Institutions include Colby College, University of Nebraska-Lincoln, Carnegie Mellon, Eastern Michigan University, Purdue University, and many more.